The Polish Economy: An Unlimited Need For People? The gentleman in the photo is Konrad Jaskola, Chief Executive Officer of Polimex-Mostostal SA, Poland's biggest construction company, and according to this article in Bloomberg, he has just one message for us all: "I have an unlimited need for people". 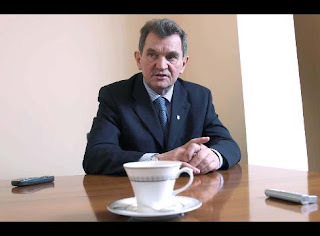 The issue arising is that Joskola has plans to hire "several thousand" new workers next year to meet demand for new bridges and factories, but he has a problem, and the problem is that due to Poland's growing labour shortages he may have difficulty finding them. Poland's economy has been growing strongly in recent quarters, although not as strongly, it should be noted, in some of the more evidently "overheating" economies like the Baltics. Poland's economy expanded an annual 6.4 percent in the third quarter of 2007, following 6.7 percent growth in the second quarter and 6.8 percent in the first one, according to data released by the Warsaw-based Central Statistical Office at the end of November. This strong growth rate is partly fueled by construction activity and partly by strong consumer demand for retail items like cars and washing machines. 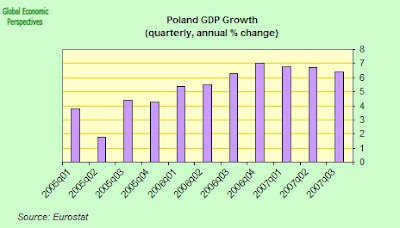 Construction in Poland rose 20 percent in the first nine months of 2007, and as can be seen in the chart below - which offers a breakdown of Polish GDP growth by components, construction has been playing a very important part in the process. The thing is, however, that construction activity is pretty labour intensive. According to Joskola, Polimex needs to offer higher salaries across the board, to engineers and managers, and to on-the-ground site workers, as Poland's skilled workers steadily move abroad (like all that hedge fund money which is flowing in the opposite direction) in search of higher yield. As a result local competition for workers increases, and wages start strong upward climb. Polimex has raised wages by 11 percent over the last 12 months and plans to raise them them by a further 10 percent next year. The company, which is a "recycled" formerly state-owned machinery supplier, established to drive Poland's post-World War II reconstruction effort, currently plans to spend as much as 200 million zloty on acquisitions next year, in order to add workers and production capacity. I imagine some, at least, of those acquisitions will have to be of workers coming from outside Poland. Meantime Polish inflation accelerated to the upper end of central bank's target range in November on the back of higher food and oil prices, meaning policy makers at the central bank may be forced to raise interest rates again in the coming months, in so doing possibly pushing up the value of the zloty, and attracting even more funds in search of even more workers to put to work. The unemployment rate fell for the ninth consecutive month in October to 11.3 percent from 11.6 percent in September, the office said in a separate report today. Earlier this month, the office said that average corporate wages advanced an annual 11 percent in October and employment grew a record 5 percent from the year before. As I say, inflation in Poland is also being fed by a 10 percent average wage growth and record low unemployment this year. In fact Polish average corporate wages advanced in November at the fastest pace in more than seven years, suggesting that the very rapid economic growth and large scale out-migration of key age group workers may be squeezing the labour market more than people imagined, thus provoking the sharp rise in inflation. Wages rose at an annual 12 percent rate (and 4.8 percent from a month earlier) to 3,092.01 zloty, according to the Warsaw-based Central Statistical Office earlier this week. 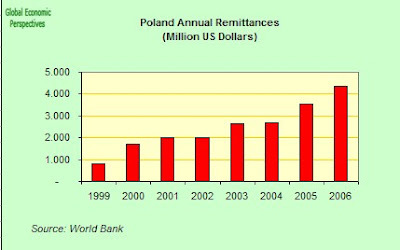 Remittances from abroad, mostly by taking advantage of free movement of labor within the European Union, are currently estimated (by the Polish National Bank) to be worth almost 2.5% of the gross domestic product of 250 billion euros. Since the United Kingdom opened its labor market to Poles three years ago, at least half a million Poles have settled in Britain. Marcin Korolec, under-secretary at Poland's ministry of economics is quoted as saying that "the statistics show that the transfer from Polish people working abroad is something like 6 billion euros a year....Obviously this is a huge amount of capital, a huge amount of flow. It has an impact on internal consumption and internal growth." Polish October retail continued their rapid rate of annual increase adding to evidence that economic growth remains strong despite four interest rate increases from the Central Bank so far this year. 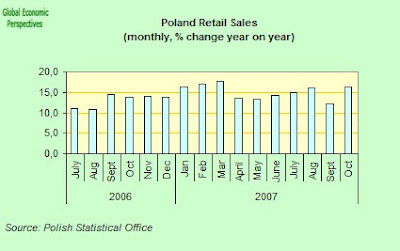 Retail sales rose an inflation corrected 16.3% in October over October 2006, this was up from a 12.2% rise in September compared with 14.2 percent in September, according to the Warsaw-based statistics office today. The growth which is driven by sales of vehicles (which rose 42% year on year) and sales furniture and household appliances (a 21.9% annual rate of increase) - confirms the impression that consumer demand is being bolstered by falling unemployment, which dipped to an 8 1/2-year low, higher wages, which last rose the most in seven years last month, and a steady and economically significant inward flow of remittances. Monetary Policy in A Bind? The central bank lifted the seven-day reference rate a quarter-point to 5 percent only last month, and this was the fourth increase since April, when the key rate was 4 percent. So as we can see, at this point of time , and against all traditional expectation, monetary tightening may actually be having the perverse effect of accelerating the economy. At the same time the zloty continues its rise, trading at 3.6150 per euro in Warsaw this morning following the release of this weeks wages data, thus holding near its highest level in five and a half years. It is strange that accelerating wage inflation should be read by the markets as good news, but still this is where we are, as investors anticipate rising interest rates and higher yields. Clearly this will continue until it no longer can. So as the Monetary Council begins its 2 day December meeting in Warsaw today, we can see that there are some difficult decisions out there to be taken. And, in a sign of the growing stresses and strains, members of the council have already made public some of their divergences, with policy maker Marian Noga taking the view that "The sooner we have the hike, the better, as preventive action is cheaper than boosting rates to chase down inflation", while Council member Miroslaw Pietrewicz holds that Poland's central bank should delay raising the benchmark interest rate until policy makers have had time to assess whether the four increases already made so far this year have been sufficient to bring inflation into check in the mid term. 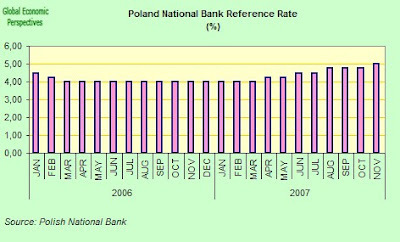 What this dispute is a reflection of are the serious issues which arise concerning the actual ability of conventional monetary policy to work in a situation like the one facing Poland, since raising interest rates may just as easily stoke up more inflation - as we have seen in Australia and New Zealand, and to some extent in China - by attracting more investment funds into the country. This issue became apparent when the zloty also gained after a central-bank policy maker Marian Noga said the interest rate may have to rise as much as three-quarters of a percentage point before the end of 2008 to ward off inflation. Normally, an impending rise in inflation and a monetary tightening process (which reduces growth) would be considered to weaken and not strengthen a currency. So what happens next? Well this is just what we don't know, since we have never been here before. Clearly these economies will continue accelerating till the day they can't. And after that, well we will have to wait till we get there to actually see. What is happening in Hungary may give us some clues, and what happens next in the Baltics will definitely provide another of the missing links. Meantime we are in "wait and see" mode I feel. And behind Poland, roaring down the track come Russia and Ukraine, remember. Just Why Is Hungary So Different From The Rest of the EU10? 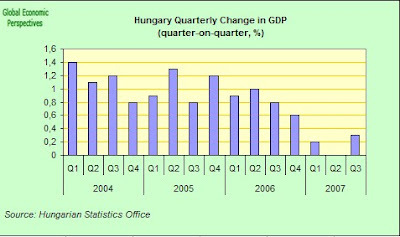 According to the Hungarian Statistics Office (KSH) gross domestic product grew in Hungary by just 0.3% on a quarter by quarter basis from to July-September 2007. The KSH also took the opportunity to reduce their growth figure for the second quarter to zero, which was down from the previous 0.1% estimate. On a year on year basis, economic growth in Q3 was just 0.9% according to unadjusted data or 1.0% if you prefer your figures to be adjusted for seasonal and calendar effects. In either case this is a very low reading end especially when you bear in mind the very rapid growth we are seeing in many other EU10 countries, and all the indications are that this figure is likely to drop further. Which raises three questions directly in our minds: a) why is Hungary so different from the rest of Eastern and Central Europe, b) where is Hungary headed, and c) what can we learn from Hungary about the future path of those EU10 economies who are now visibly overheating, after they have passed through their inevitable "correction" that is. 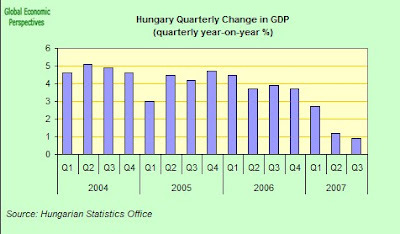 Looking at the evolution of Hungary's GDP on a year on year basis, the slowdown is evident. The first thing that strikes you when you look at the chart below is that annual growth rates seem to have peaked in 2004 (that is before the correction and fiscal adjustment of 2006), growth slowed entering 2005, and it was at this point that the expansion in the fiscal deficit became important, but it was a fiscal expansion to try to arrest a general downward tendency in the rate of output expansion(very reminiscent in its way of things we have seen in Japan and Italy if we work our way back through the data). 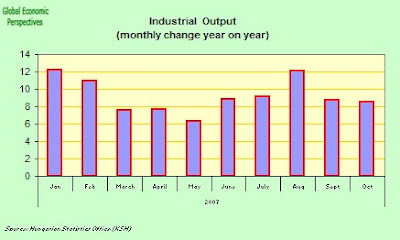 And on a year on year basis Q3 2007 represents yet another step backwards, since the comparative figure for Q2 was 1.2%. And this process seems set to continue, and I would go so far as to say that no-one at this point has any idea where the bottom is on this one. The engine behind what little growth Hungary is now getting continues to be industrial output which registered a 7.4% yr/yr growth in Q3, and this output was pulled along to a considerable extent by the 14.6% export growth which was registered. The main drag on growth was, unsurprisingly, final household consumption, which declined by 2.0% yr/yr. Previously, the slowest pace of growth in recent memory was back in 1996 when the fiscal adjustment package of Economy Minister Lajos Bokros pushed growth to below 1% y-o-y. If we now come to look at the evolution of GDP shares for some of the components, we will see, for example, that both agriculture and construction have been more or less stable in recent years (ie we have not had any sort of dramatic construction lead boom in recent years. On the other hand, if we look at manufacturing and real estate and financial services, we will see that the latter have clearly grown in importance in relation to the former, which is in many ways a pretty normal development. On a quarterly basis, the largest growth was observed in industry (3.1%), followed by services (1.3%) and transport, storage and communications (0.9%). Consumption expenditure of households fell by 0.8% yr/yr and 0.2% q/q, while public consumption fell by 3.8% yr/yr and 3.2% on a quarterly basis. The rise in imports pegs pretty closely on to the the coat-tails of the rise in exports, something for which the very strong value of the forint must undoubtedly bear some responsibility, since as the euro rises, and the forint clings on to par with the euro, the general tendency of opening the doors to products from China and other low-cost manufacturers (as well of course Japan, and a now much cheaper and more competitive United States) must have a reflection of the Hungarian import situation. So it is really rather cold comfort that the 0.3% q/q growth obtained in Q3 is the largest so far this year, firstly because, as Portfolio Hungary indicate, it is disappointingly small and secondly, because it would really be very premature to start speaking of any kind of upswing even in the short term. Hungarian central bank (NBH) Deputy Governor Ferenc Karvalits is quoted this morning as saying he believes the central question is not whether the growth rate of the Hungarian economy will start to increase but to what extent and up to which point. I think he is basically right, but he forgets one additional issue, when it will stop falling, and how much farther it still has to fall? Certainly if we look at the path of domestic retail sales, there is no sign at all that we are done yet. And to this slowdown in private consumption we need to add future purchasing power, since real wages are also falling in Hungary. 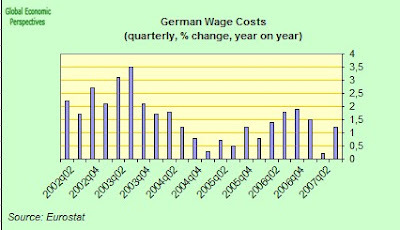 If we look at the chart below, the sharp improvement in the negative real wage tendency which we can observe in September 2007 is due to the base effect of the austerity package tax and social security measures introduced in September 2006 having moved out of the calculations (since these meant that between September 2006 and August 2007 net wages rose much more slowly than gross wages) and hence the change does not reflect any sudden spike in actual wages paid, and of course, inflation continues to be strong. And when we come to think about public consumption it is important to bear in mind that the Hungarian government - according to its own latest Dec 1st estimates - is still running a fiscal deficit this year of 6.2% of GDP. The government are committed to reducing the deficit further next year, so this has naturally to be subtracted from GDP: that is we are going to face more fiscal tightening. In fact, what is incredible is that Hungary is currently only able to get 1% y-o-y GDP growth despite this whopping fiscal stimulus. Which is why a close examination is needed of just how Hungary got into this mess in the first place, and in that context why it is that Hungary is so apparently different from the rest of the EU10. Obviously the presence of fiscal deficits has been one issue. 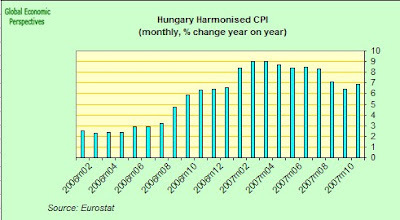 But again, and in the end, what is so striking is just how little "bang for the buck" (or forint) Hungary has been getting for all this fiscal stimulus. As I pointed out above, a lot of the sparkle had already been going out of Hungary's GDP growth some time before the fiscal correction came into force. In addition monetary policy is likely to remain restrictive. 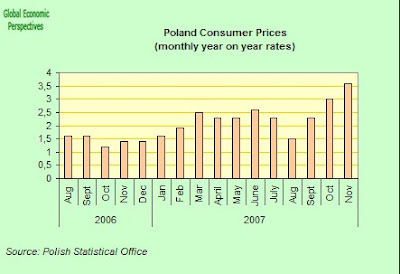 The current Central Bank base rate of 7.5% is the highest in the European Union, and there is little room for any substantial reduction given the rate of domestic inflation - the government has just agreed to raise public sector wages by an average 5% in 2008, so it is hard to see inflation being anywhere near the "comfort zone" yet awhile. Ideally, even considering the current inflation, given the state of domestic demand, you might have though that some element of monetary loosening would be desirable, especially since this would probably serve to weaken the currency, and this would help exports and in so doing increase that at present very minimal trade surplus. But it is just here that we hit one of Hungary's biggest headaches moving forward, the Swiss Franc Mortgages. 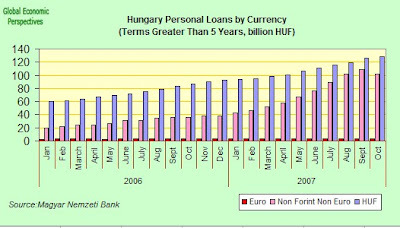 The use of non-local-currency denominated loans has become a widespread phenomenon in Eastern Europe in recent years. In Hungary the most common currency for such purposes is the Swiss Franc and around 80% of all new home loans and half of small business credits and personal loans taken out since early 2006 have been denominated in Swiss francs. A similar pattern of heavy dependence on foreign currency denominated loans is to be found in Croatia, Romania, Poland, Ukraine (US dollar) and the Baltic States, although the mix between francs, euros, the dollar and the yen varies from country to country. First off, here's a chart showing the evolution of outstanding mortgages with terms over 5 years since the start of 2003. As we can see the outstanding debt is now over 5 time as big as it was then. 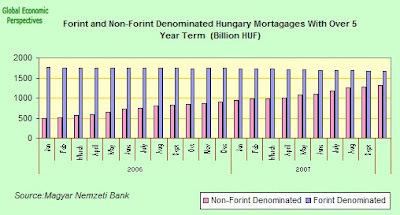 Now if we look at the growth of forint denominated mortgages over the same period, we can see that while they initially expanded very rapidly, they peaked around the start of 2005, and since that time they have tended to drift slightly downwards. 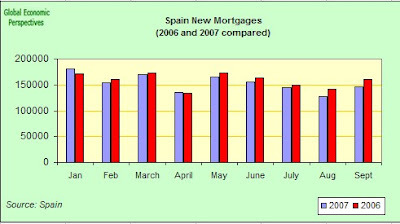 Then if we come to look at the growth of non-forint mortgages, we will see that since early 2005 the rate of contraction of such mortgages has increased steadily. The Magyar Memzeti Bank (the Hungarian central bank) recently published the October edition of its bulletin on Household and non-financial corporate sector interest rates, interbank lending rates (careful PDF). This bulletin contains a lengthy summary of the state of play with non-forint denominated loans to individuals, and in particular a section on Swiss Franc loans in Hungary. According to the Bank, following a moderation in the demand from Hungarian households for Swiss franc-denominated consumer loans, a sharp turnaround in demand occurred in October. The monthly volume of new mortgage loans for consumption purposes (ie not for buying homes, refis) leaped by 30% to reach an all-time high. It is also a noteworthy that even before the start of the real Christmas season the volume of new CHF-denominated consumer credit jumped by 25% from September, setting yet another historic high. The amount of new mortgage loans rose to the previously unseen level of HUF 130 bn in October, and this increase is almost exclusively attributable to the increase in CHF-denominated loans (HUF 120 bn). 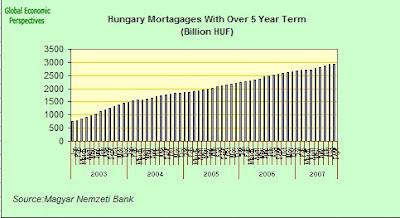 Detailed data from the bank show that while the monthly amount of new CHF-denominated housing loans rose to the exceptional level of HUF 55-60 bn, mortgage loans for consumption purposes (ie "refis" or liquidity extraction, not to buy houses) became pretty fashionable, rising by 30% month on month to reach the level of HUF 62.5 bn. Within these new mortgage loans, the ratio of foreign currency to total loans increased to 92.5%, setting yet another record. 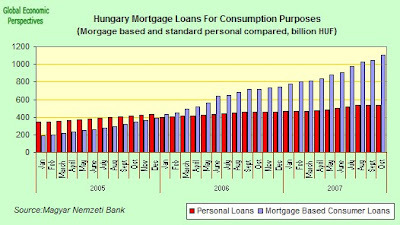 What all this suggests to me is that a lot of Hungarians are trying to maintain current consumption by borrowing forward in the hope and expectation of rising property values in the future. If this rise does not materialize, then the very least that can be said is that all of this will need, at some point, to be clawed back from current consumption. This whole process also represents a new form of moral hazard for the central bankers, since such borrowing in Swiss Francs is based on the assumption that with so many people doing this the Hungarian authorities will never dare to let the forint slide (you know, there's safety in numbers) or, pushing the buck back one stage further, the EU Commission and the ECB won't let it happen. But this is very dangerous thinking, since in the first place there are a lot of people now out there riding around on the back of the same idea (think Italian government debt, for eg), and people may be seriously overestimating the ability of the political and monetary authorities to contain such a large and complex set of problems. It should not go un-noted that the whole weight of the ECB is currently not able to stop the spread of the growing credit crunch across the entire eurozone and beyond. 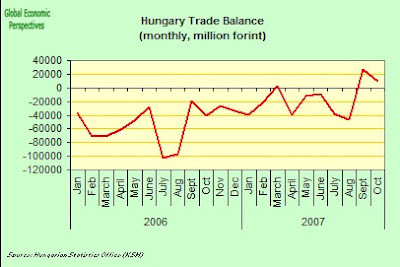 Secondly, and just as importantly, all of this puts the Hungarian central bank in a real double-bind, since they cannot ease monetary policy at this point without precipitating a tremendous weakening in the forint, so interest rates stay high, and Hungarian domestic demand gradually gets strangled, while all the inflation puts a strong brake on export growth. The translation problem that all these foreign currency loans may represent for Hungary, and some of the other EU10 economies where this kind of borrowing has become popular, are a matter which has been addressed by Claus Vistesen in this post. 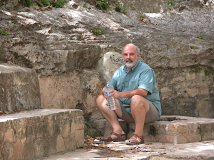 But what exactly is translation risk? Well let's take a standard type definition, such as this one from investopedia.com. Translation risk is "The exchange rate risk associated with companies that deal in foreign currencies or list foreign assets on their balance sheets. The greater the proportion of asset, liability and equity classes denominated in a foreign currency, the greater the translation risk". Now as Claus points out much of the literature here refers to companies, and most of the words spent on the subject have been devoted to the description of companies' exchange rate risk when operating in foreign countries under insecure exchange rate systems and obviously subsequently how this risk can be hedged through the use of derivatives, or simply by adequately calibrating the denomination of the stock of liquid assets held on the balance sheets. But the issue in Eastern Europe is that the majority of this credit has been extended to households through loans intermediated by foreign financial institutions and thus it is unhedged, and even more to the point this borrowing is being facilitated either by bank flows or inward FDI which is what enables the current account at the end of the day to balance. The big problem will come if ever the direction of these capital flows reverses, and this is precisely why the Hungarian central bank is constrained in the way it can loosen monetary policy, since it simply cannot afford to either risk a reversal in the flow of funds, or a sharp rise in the cost of private debt servicing should the forint weaken significantly in value. Those analysts who focus only on the secondary issue of steering inflation expectations are missing the bigger part of the problem here. As we are now seeing in the United States, and as we may well be about to see in an ECB context (indeed arguably we have already seen, since the inflation data treated alone may well have warrented an ECB raise this month) if expectations are your only problem, then the central bank can afford to be more flexible than many imagine. So to return to where we started, just what is it that makes Hungary so different. The simple answer is that I don't know, but I know that it is, and that we need to keep digging. The philosopher Francis Bacon held that the important thing about doing science was to know how to put the right questions to nature, and the answers we get to some extent depend on the questions we ask. My intuitions tell me that Hungary's very special demography has something to do with it all, but others do not agree, and do not ask this type of question. But if we come to look at the demography, there are some things which we can hardly fail to notice. 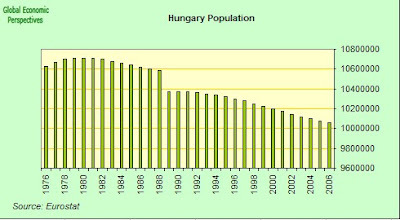 In the first place Hungary's population has been falling, and for many years now, in fact it peaked around the start of the 1980s. Now something has to be said here. Noone knows what the long term consequences of having a declining (and ageing) population like this is going to be. We don't know, because quite simply we have never been here before. In previous periods, after a war or a plague, when population had fallen the Malthusian homeostatic mechanism of increasing wages lead to increased fertility, and this in and of itself corrected the problem. Indeed in some parts of Eastern Europe (though not Hungary) we are seeing a demographically driven form of wage inflation, but this is not leading to a homeostatically corrective rise in fertility because, quite simply, the old correlation between increasing wealth and increasing fertility has now been broken. More money today does not mean more children, indeed under certain circumstances it may mean less. So basically we don't know where we are going here, and my advice is don't let anyone convince you otherwise. Having said all this, intuitively less people ought to constitute less domestic demand pressure, but this issue is undoubtedly more complex than this. 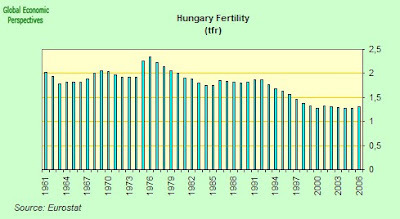 Turning now to fertility, it is worth noting that, apart from a brief episode in the late 1970s, Hungary has in fact been struggling with below replacement fertility since the early 1960s. The only real "novelty" about the 1990s is that Hungary transited from below replacement fertility, to lowest-low fertility (1.2/1.3 Tfr region). 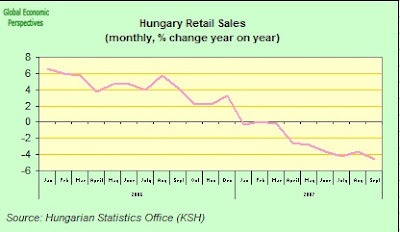 Returning then, and in a demographic context to Deputy Central Bank Governor Ferenc Karvalits' question about how far and to what extent Hungarian growth will recover, as we have noted, domestic demand has been in virtual free-fall in recent quarters. What is not clear is when (ot whether) this component will ever recover to the extent of being able to drive growth, since now start to get into age-related elements (which I know not many people agree with me about at this stage, but still). 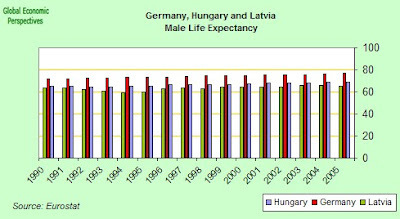 As a result of ongoing low fertility, and rising life expectancy, Hungary's median age is, of course, climbing steadily, and calibrating the macroeconomics of this ageing process in the context of Eastern Europe's comparatively low male life expectancy (ie calibrating how domestic consumption loses its relative strength as median age rises, in the way we have seen in Germany, Japan and Italy) is something noone has done at this point to my knowledge. In fact most people you talk to don't imagine that this is important, but then most of them didn't imagine that Hungary would fall into the hole it is currently falling into. As we can see below, Latvia and Hungary, despite having started the 1990s at not such a great distance from Germany, now have considerably lower median ages (please click on image for better viewing). But this lower population median age is hardly a positive outcome, since it is not due to higher fertility or strong inward migration. Rather it is due to their much lower male life expectancy. As we can see, male life expectancy is considerably lower in both Hungary and Latvia, than it is in Germany, and this must have consequences for economic behaviour and performance. 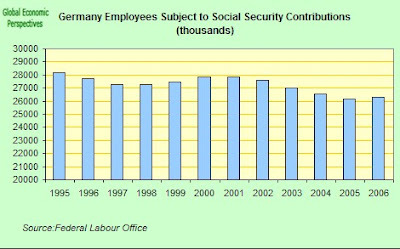 Increasing the working life to 67 and beyond as they have in Germany is just not the same proposition at all in a lower life expectancy society like the other two, nor is the issue of getting employment participation rates among the over 60s comparable given the evident health problems of one part of the population. So while we would not normally expect domestic consumption to run out of steam until the median age reaches 41/42 (this is the sort of lesson we can garner from Germany, Italy and Japan) there may be good reasons for imagining that this median age needs rounding down somewhat in the Latvian and Hungarian contexts. I will certainly stick my head out and say that the property boom which is now in the process of petering itself out in Latvia, like the 1992 one in Japan, and the 1995 one in Germany, is very likely to be the last of its kind we will see there, high median age societies just don't work like this. They do not ride on the backs of credit driven booms, and I would have thought that the reasons why would be obvious. Indeed, if we look at the proportion of construction in Hungarian GDP, this sort of confirms my suspicions, since in general terms this has not constituted a large share. 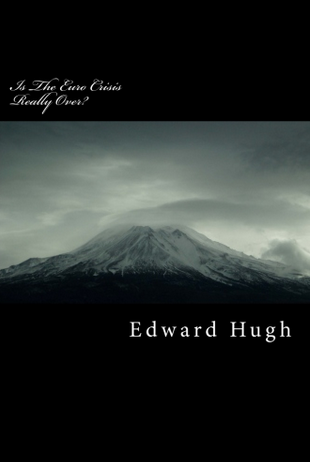 Indeed what we can note, as might be expected, is a very strong weather-driven annual cycle, and if there is any sort of trend discernible, it is ever so slightly downwards rather than upwards. This, again would fit in with a gradually ageing and declining population. The position is only confirmed if we come to look at the housing cost index. So the first thing that strikes us is a local boom which we can see in the early months of this year, and which has since faded (and this is more than likely associated with a removal of public housing subsidies, a sharp rise in rents, and therefore a shift in the relative appeal of purchased property - always, of course, on low interest Swiss loans - and all of this at a time when internal demand is to all intent and purpose collapsing). Before this we can note the surge in prices in 2003/04. 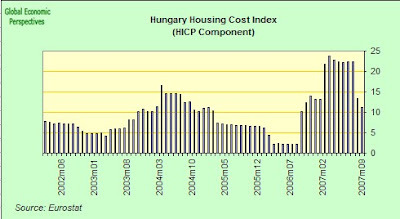 My guess is that this is/was Hungary's property boom, and that this phase has now come and gone. 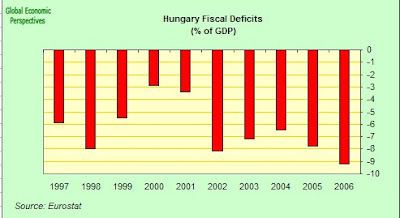 This also helps explain how the Hungarian fiscal side got into such a mess in 2005, as the government was increasingly having to shoulder the load against a faltering domestic demand. All of this is, as I say, very different from other parts of the EU10. In conclusion then, we can assume that given sufficient determination by the central bank to hang on at all costs to the value of the forint, and absent a major external exodus from Hungary on the backs of a more general crisis, the systematic and sustained tightening on all fronts will eventually produce nominal as well as real wage deflation, especially if we sink into a deepish recession, which seems to look all but unavoidable when we come to think about the third factor - external conditions - which are almost certainly going to deteriorate over the next 6 to 9 months, as the powerhouse economies of the eurozone - Italy, Spain and Germany (France is the only semi-brightish star on the horizon) are all slowing mightily even as I write. So the message here is now twofold. 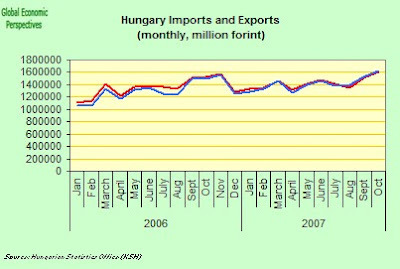 Strap yourself in tight, since it is going to be a very bumpy ride, and secondly, Hungary is now about to join that honoured group, the export dependent economies. Of course, how rich she will ever get to be due to all the structural difficulties must remain a very open question. Well Claus is currently up to his eyes in exam preparations, that and recovering from his incredible tour-de-force yesterday, so I will take over the eurozone tiller momentarily, and give a brief lead-in to today's interest rate decision over at the ECB. (Update: since this post was published the ECB have announced - as expected - that they are keeping rates on hold. Euro values are not taking the news well - or perhaps they are taking them too well, depending on your view - since Trichet has said that some board members actually wanted to raise, but for the rest, I think this post stands up fine as is). So, if it is the eurozone we are talking about, then why not start with Germany? 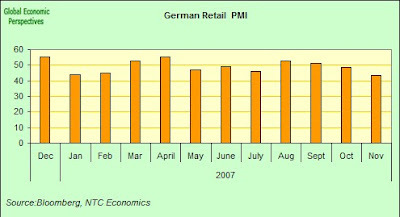 And what better place to start than with German retail sales, which fell fell at the fastest rate in more than three years in November according to the Bloomberg purchasing managers index, which fell to a seasonally adjusted 43.6 from 48.6 in October. Any reading below 50 on this index indicates contraction, thus retail sales have only managed an increase - as measured by this index - in four months this year. Retail sales across the entire 13-nation euro region also fell in November according to eurostat data released yesterday, dropping by 0.7 per cent from October to a level which is just 0.2 per cent above the November 2006 level. Of course this average hides considerable variance, with the weakest performance coming from Germany, Italy and Belgium. Also worthy of note is the performance of retail sales in Spain (the zones 4th largest economy) since strong growth in Spain has previously offset weaknesses in Germany and Italy at critical junctures. But this time it will be different, since Spanish retail sales have fallen in both October and November, and while the year on year readings are still in positive territory, they will not remain there for long since the earlier strong readings will eventually drop out of the data. And since the spring the story in both services and manufacturing has been one of one long and sustained declined, as the data from the monthly Bloomberg/NTC Purchasing Manager Indexes reveal. 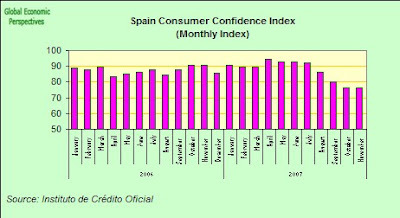 Meanwhile the consumer confidence index prepared by the Instituto de Credito Oficial continues to plummet the depths, registering at 76.1 in November a historic low for the third consecutive month. This drop in confidence is also reflected in the data for new mortgages issued (latest data still only September unfortunately), where the slowdown is clear if you compare the numbers for 2007 with those for 2006 (and especially since the spring, although my feeling is that when we get numbers for October and November we will see the slowdown accelerating, as buildings contracted in 2006 reach competion. Of course we should remember that those buildings and flats sold on the basis of architects plans in June and July - ie prior to the August sub-prime "bust" - will still be giving work until next summer, even if the would be purchasers may be increasingly looking for an "escape clause" as property prices steadily decline). 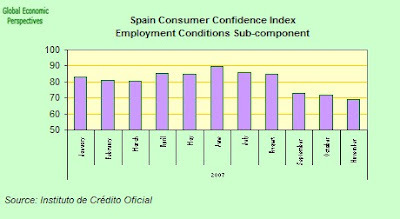 If we turn to the employment sub-component of the Spanish index we will see that the outlook has changed dramatically in the last three months. and the underlying situation again becomes clear if we look at the unemployment numbers, where a comparison between 2006 and 2007 is again revealing. We can see that in the early months of this year the employment situation was up over 2006. Then the situation turned (around July), and since then it is "down hill all the way" unfortunately. Italy of course isn't in much better state, and Italian retail sales declined for the ninth month this year in November as the bleaker economic outlook continued to damp consumer demand, according to the Bloomberg retail purchasing managers index monthly survey. 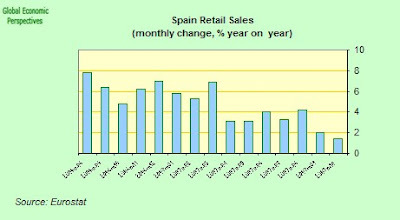 The reading has been below 50, the level that signals a contraction in sales, every month except January and February. And at 50.6 (January) and 50.4 (February) sales were barely increasing (on a seasonally adjusted basis) even then. Of course Italy has long been regarded as the "sick man of Europe" so this result is not too surprising. Business confidence is non-too strong either, and the ISAE Italian business confidence index declined in November to the lowest level in almost two years as the euro's gains have continued to acting as a curb on exports. The Isae Institute's business confidence index fell to 92.2 from a revised 92.8 in October, the lowest reading since December 2005. 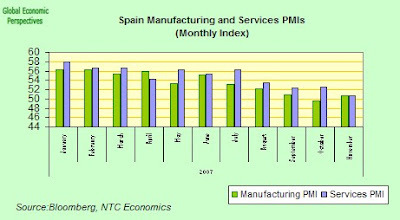 In addition the Italian services sector purchasing managers index fell to a seasonally adjusted 50.8 in November from 55.3 in October. 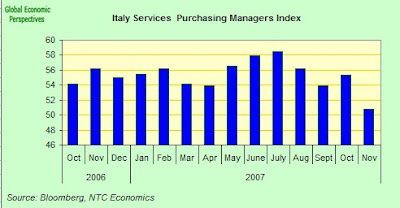 So Italian services are still ekeing out a small expansion, but they are creaking. 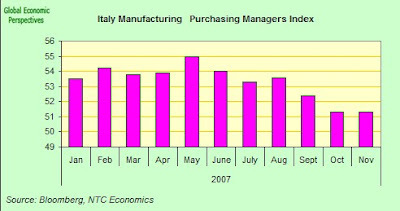 While the Italian manufacturing sector purchasing managers' index remained at a seasonally adjusted 51.3 in November the same level as registered in October. So in both cases, the expansion continues, but only just, which is the same thing as saying that- since the negative exports balance is now a net drain on GDP growth, and government spending should be under a tight rein to bring down the debt - the the Italian economy may now be near to a contraction phase. Returning now to take another look at Germany, what is most curious is how German consumers are reining-in spending and becoming ever more pessimistic even as the jobs market remains reasonably buoyant. 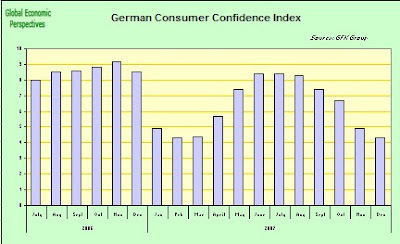 Earlier last the week we learnt that German consumer confidence, as measured by the GfK AG's index had fallen to the lowest in almost two years. 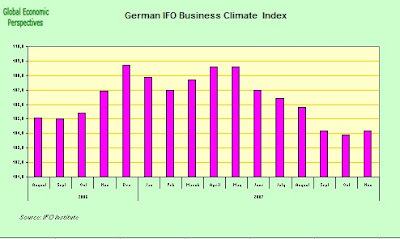 Business confidence is not much better, with the IFO index - which managed a very modest recovery this month from last month's low - in very negative sentiment mood (and the ZEW index isn't any better). 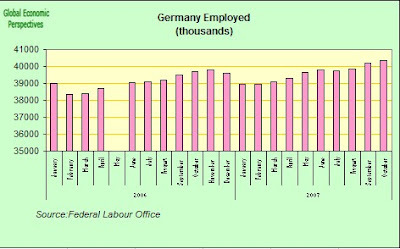 Meantime German unemployment declined for a 22nd straight month in November, falling to the lowest level in more than 14 years (using ILO methodology), as companies took on more workers to meet increased demand. 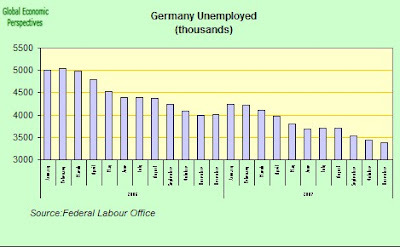 The adjusted number of people out of work fell by 53,000, according to the Federal Labor Agency in Nuremberg. The jobless rate, adjusted for seasonal swings, slid to 8.6 percent in November, the lowest since April 1993, from 8.7 percent in October. In fact the total, unadjusted number of unemployed is the lowest for the month of November since 1992, when it was 2.97 million, according to Labor Minister Olaf Scholz. 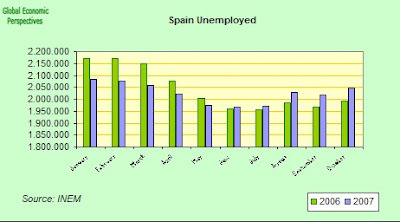 In addition the number of those employed continues to rise. So looking at these numbers, you might wonder what all the pessimism is about. Well the problem basically revolves around why increases in German wages and salaries have, despite this exceedingly positive general situation, remained generally weak. What is notable about the above chart is the way in which the tightening labour market has not produced any substantial upward pressure on wages. Of course, one version of the story would tell us that this is because the German workers have been behaving like very good boys and girls. But is the more too all of this we might like to ask ourselves, especially since all of this is more or less a repeat performance of what has been happening in Japan. 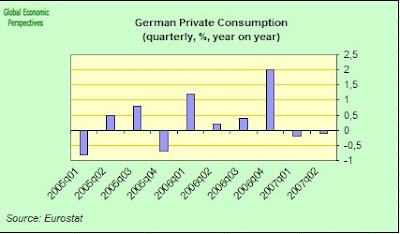 And of course the weak earnings situation is passed on to consumption, with the consequences we can see in the chart below, which if for the quarterly development of private consumption in Germany since the start of 2005. No economic locomotive to be seen there, I fear. And before you leave the chart do note just one more time that spike in consumption in the last quarter of 2007. That's the VAT effect, you know, the one everyone tried to tell us didn't exist. Well it did, and just look what happened next to German consumption after the 3% hike. Relative prices, like relative exchange rates, do of course matter, and anyone who tries to tell you otherwise missed something in their basic economics course, I think. Unfortunately one detail we don't have relates to the role of part-time employment in these numbers. I have been looking in detail at the Japan data, and there we do have this breakdown, and it is clear that the growing disconnect whereby we have significant GDP and employment growth by comparatively weak earnings and consumption performance may have something to do with this, and with the skill composition of the work being undertaken. Of course here I would see an age related dimension, but I guess for some that would be quite a tendentious point. 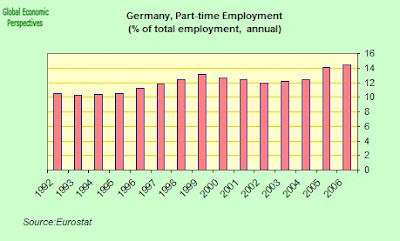 Nonetheless we do have data from the recent past about the share of part time employment in total employment in Germany, and as we can see it has been steadily rising. Be all this as it may, it seems that the path of Jean Claude Trichet will not be blocked, and that our stalwart central bank president - like the ubiquitous Ms Thatcher before him - is not for turning. This gentleman is not going to let himself be brow-beaten by mere fact. Trichet in fact once more emerged from his un-announced early within-cloister retirement from the high-media-profile stage yesterday to give a talk in Berlin (in preparation, one imagines, for his ECB performance today) where he singled out Finnish nurses and German postal workers for particular criticism, holding they not taking sufficient account of their social responsibilities. What he means is, of course, that inflation is putting the ECB in a very clear double bind when it comes to taking a decision on interest rates. But wages, as we have seen are not the pricipal issue here, at least in the German case (and the Finnish one is not that much different). The real culprits in the eurozone inflation surge - the last flash estimate from Eurostat put the eurozone average HICP rate at around 3% for November - are energy and food prices, and this inflation has more to do with global structural factors than it ever does with minimum wages in the eurozone (ie it is a result of the fact that the BRIC economies etc are driving the growth, and their rates of energy consumption are rising rapidly, while their population spends a higher part of their rapidly rising income levels on food products - maybe 25% of the extra income - than is the case in the developed economies). Other explanations for the pessimism to be found in Germany (ie beyond the employment and wages data), of course, abound. Two prime candidates, oil and food price induced inflation and the rising euro tend to head the list. The euro, which rose to a record $1.4967 on Nov. 23 before dropping back slightly, has gained more than 12 percent against the US dollar so far this year and is trading at around $1.4673 as I write. Crude oil rose to a record $99.29 on Nov. 21 and was trading at $89.42 in electronic tradiong on the New York Mercantile Exchange earlier today. The rising euro may well have an impact on Germany's export performance, while oil prices influence inflation, and through this consumer purchasing power. In fact inflation jumped in Germany in November to 3.3 percent according to the EU harmonised index, and this is the highest level registered in Germany since records began in 1996. The European Central Bank, which has raised the benchmark interest rate eight times since the end of 2005 as part of a "normalisation" and anti-inflation process, meets today to decide on interest rate policy . So far the bank has been buying time by arguing we still cannot adequately judge the impact of the financial turbulence spin-off from the U.S. housing slump and in exercising this caution they are almost certainly right. As Claus indicates in this post, there are indeed tough times ahead at the ECB. And indeed there are. Only yesterday the Italian Vice Minister for the Economy Vincenzo Visco was informing a parliamentary panel that "The economic situation and world markets are very uncertain and present risks. 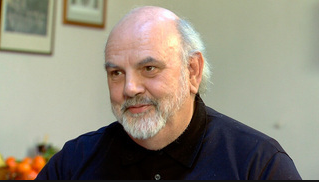 It is expected that the Federal Reserve will cut interest rates and it would be suicide if the ECB didn't do the same thing for the euro zone." And it is not only the politicians this time round, ECB council members Christian Noyer and Jose Manuel Gonzalez-Paramo have been indicating that they are prepared to start talking interest rate reductions in a not very distant future. 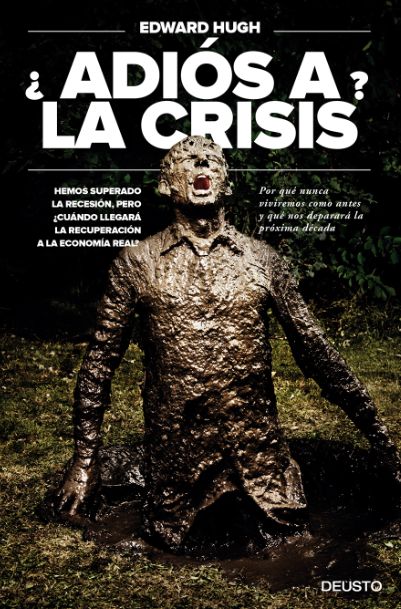 Noyer is saying that there has to be a "question mark" over whether or not Europe can dodge the fallout from the U.S. sub-prime generated turmoil (and see this post for an examination of the extent of the credit shock in the European banking system), while Gonzelez-Paramo rejected the idea that cutting rates would amount to a bailout of investors who lost money on bad bets. Central banks are not encouraging risk taking if they lower borrowing costs "when financial turbulences develop into a fully fledged crisis and eventually affect growth prospects" he stated at a conference in Milan earlier this week. So while we may well see a stand firm "on hold" posture on rates today, a change in the air cannot be far away now. Even on the euro front "the times they are a changin", and rapidly rapidly, with even German Finance Minister Peer Steinbrueck - who as recently as Nov. 27 was expressing his confidence that Germany had "become much more resilient to negative economic impetus" and was going through a "robust recovery" is now suggesting that what we have is "a disorderly adjustment and unwinding." In fact German leaders generally are now expressing a mounting unease over the euro's rise against the dollar and other currencies , and especially as survival warnings from European planemaker Airbus ring through their ears. And remember, the weaker dollar can help American exporters at a time when the U.S. economy is suffering from a housing slump, trouble in mortgage markets and a going-global credit crunch "Exports are a huge bright spot in the economy ... and a source of strength going forward," Janet Yellen, president of the Federal Reserve Bank of San Francisco, is quoted as having said on Monday. As I argue in this post, the longer term problems in the US economy aren't anything like what they are currently being made out to be. 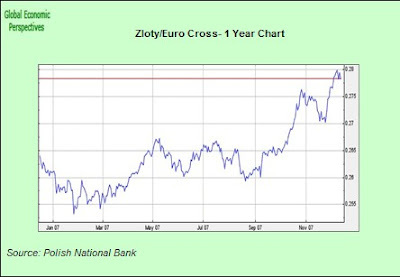 Of course the euro is now more than 20 percent over its dollar value two years ago and has been hitting record peaks recently against the yen, while China's currency has lost ground to the euro even while it has gained it against the dollar. Yet despite this, the trade-weighted rise in the euro this year has been limited to just 4 percent. But this is just the point, what we need to ask ourselves is where the exports are currently headed, and what the prospects are in those countries. It is very important to take note of the fact that Germany's strong export performance has been to countries like the UK, and Spain, who may now struggle in the wake of the sub-prime crisis, and to large chunks of Eastern Europe, where some key economies may now be on the point of undergoing a major correction. The fact of the matter is that German exports to the Czech Republic were roughly equal in value last year to German exports to China (and both of them were less than, say, German exports to Poland). That is a good measure of the importance of the Czech Republic for the German economy, but it is also a measure of just how poorly positioned Germany actually is in China, and generally throughout emerging Asia as we move forward. At the end of the day exchange rates do matter, and perhaps the recent visit of EU dignitaries to China (and what they have realised during their visist) has as much to do with Mr Steinbrueck's change of heart as anything. Postcript: the astute reader will note that out of the eurozone big four - Germany, Italy, Spain and France - there is no real mention of the Frech economy in this post. This is largely becuase, important as it is to the eurozone, Claus and I by and large take the view that the French economy is "Monsieur Average" in eurozone terms. By this we mean that the French economy - despite an ever present need for adaptation and reform - is very far from being the European sick-man some ideologues would make it out to be, just as the US economy - and see this excellent piece from MacroMan - is far from being the global economy sick man another group of ideologues would have us believe (isn't it curious how most of the ideologues like to line themselves up around an axis which goes from France to the United States?). So growth in France will be what? Well guess - average, neither powering the euro economy forward, like Spain has done in the strongest moments of its housing boom, nor acting as a sheet-anchor drag like Italy tends to do in the worst of her downswings. Indeed, given this Monsieur Average quality a good argument could be made that France is the one eurozone economy that has been exposed to more or less appropriate monetary policy and interest rates since the inauguration of the euro. And guess what, interest rates, just like exchange rates, do matter. Alarm Bells Ringing in Romania?